The Grand Velas Los Cabos is an all-inclusive resort paradise. Looking for an inspired beachfront vacation? The Grand Velas Los Cabos on Mexico’s Baja Peninsula is easily accessible from O’Hare and promises an unforgettable family adventure. 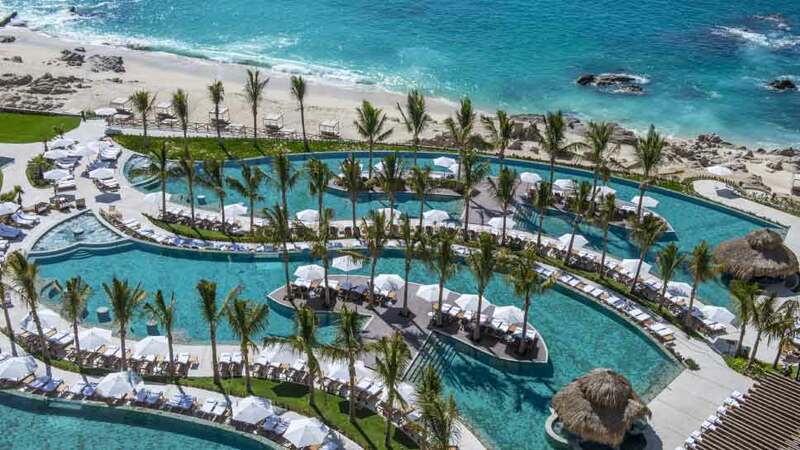 Opened in December 2016, the newest Grand Velas is the fifth property of Velas Resorts. This stunning oasis boasts dramatic ocean views and, as my family discovered during a recent getaway, all-inclusive, unabashed luxury and service. Whisked from the airport, the drive was a mere 35 minutes to the exquisite resort. Upon arrival, we were welcomed into the iconic grand open-air entrance that is three stories high and more than 300 feet above sea level. After check-in, our personal butler-concierge escorted us to our room. The only thing more impressive than the size of our suite—more than 1,100-square-feet—was its breathtaking views of the ocean. These could be savored from the bedroom’s expansive windows, the bathroom’s soaking Jacuzzi tub and from the oceanfront balcony featuring a full-sized bed and a sitting area. We spent many evenings here gazing at the view, bathed by soft ocean breezes, enjoying the scent of the bougainvillea entwining the balcony and listening to the ocean’s symphony. Five gourmet restaurants and two casual eateries dot the Grand Velas grounds. Renowned chefs are at the helm including a two-star Michelin chef. The broad range of restaurants invites you on a global journey of cuisine at Piaf (French), Lucca (Italian), and Frida (Mexican). On our first evening, we dined perched dramatically over the golden sands of Los Cabos at Velas 10. Dining on indulgent Wagyu beef and the largest lobster I have ever seen was the perfect introduction to the delicious cuisine of Grand Velas. Our second dinner brought us to Frida, named in honor the famous Mexican artist, Frida Kahlo. In an elegant indoor/outdoor setting with gorgeous ocean views, modern Mexican fare was served with a flourish. The Churro dessert is something that must be tried; it is a sinful treasure. This traditional churro is served with cinnamon stick sauce, candied peanuts, and orange segments and topped off with an Abuelita chocolate sauce. Pure heaven. On our last evening we dined at Lucca, a beautiful restaurant celebrating the culinary flavors of Italy. Our dinner began with a Caprese salad. For the main entrée, we enjoyed a lamb ragu with homemade pasta strips, porcini and morel mushrooms, and a salmon in a gremolada lemon sauce with garlic and parsley—truly magnificent. The resort’s master sommelier paired each course with the perfect wine. We concluded the meal with the best tiramisu of our lives. 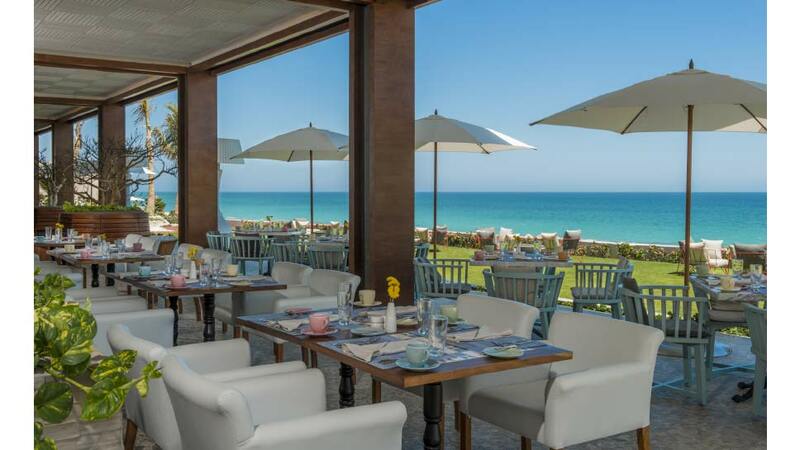 Our breakfasts were enjoyed ocean-side each morning at the bright and airy, family-friendly Azul restaurant. An expansive buffet held a little bit of everything, including fresh tropical juices and rich Mexican pastries—the perfect morning ritual. There are endless activities at the resort—from silky white beaches, to three infinity pools, a fitness center, a kids club, and a teen lounge. However, Cabo offers plenty of activities to tempt visitors away from the resort. One of these activities is not to be missed if you are visiting between December and May. Baja is home to eight of the world’s 11 whale species, who visit the area to give birth and raise their young. On our high-speed inflatable boat excursion with Cabo Adventures, we had a front row seat to the antics of a baby whale—he (or she) leapt out of the water repeatedly to the absolute delight of my daughter Redding. We saw many whales who had made their way south to take advantage of the warm climate and shallow waters found around Cabo. This was the only outside adventure we booked because we wanted to spend all of our time at the resort. 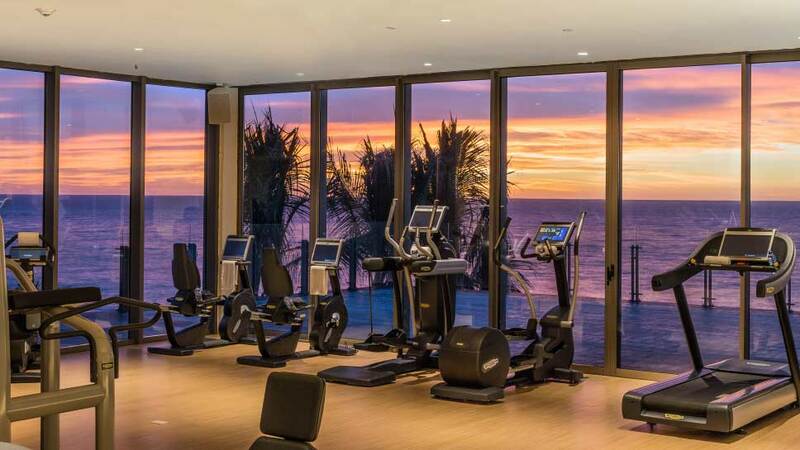 Every morning we headed to the state-of-the-art fitness center that offers personal trainers, exercise classes, yoga, Pilates, and meditation. Yoga ocean-side is a must. We worked out in front of a glass wall overlooking the ocean and were thrilled to catch glimpses of whales as these delightful creatures swam by. The stunning 35,000 square-foot Spa is known for its Water Journey and its signature Mexican spa treatments. Guided by a personal spa valet, my daughter and I were taken on a multi-sensory journey that transcended the typical spa experience. We enjoyed the refreshing contrasts of the Jacuzzi, sauna, steam room, and polar ice room. After this experience, we were guided to an enormous room for our Velas Blue Agave Massages—we left feeling completely relaxed, recharged, and at peace. Isn’t that what vacations are for? 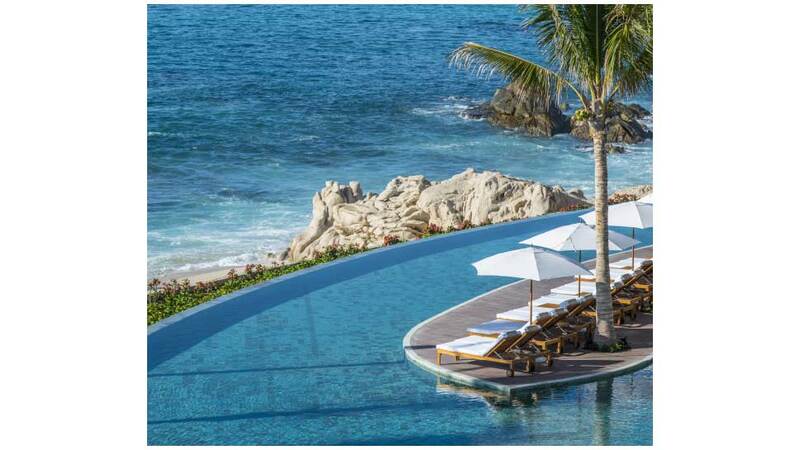 For information about Grand Velas Los Cabos, email [email protected], call 1-888-407-4869, or visit loscabos.grandvelas.com. 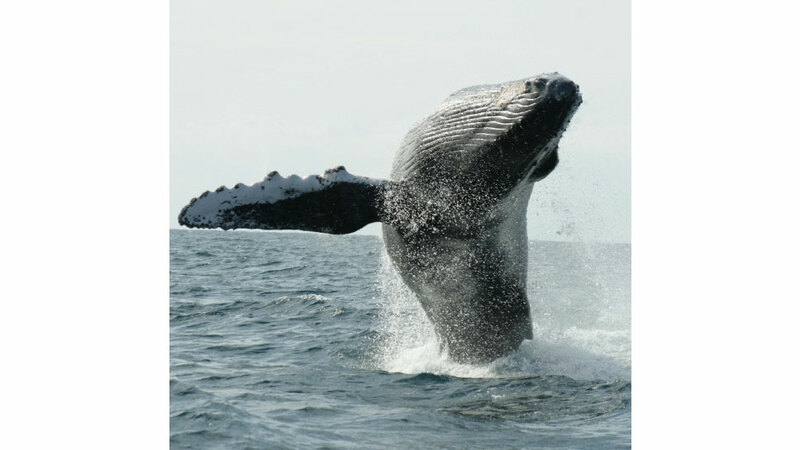 For information about the whale watching adventure visit cabo-adventures.com/tours/whale-watching-photo-safari.